All-purpose cleanroom cleaner filtered to 0.1 microns. Recommended dilutions the formula claims sodium and potassium levels detectable only in parts per billion. Will not generate a static charge and with no residue build up it will not affect the efficiency of conductive flooring. 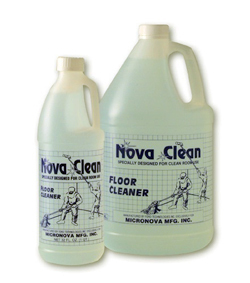 NovaClean Floor Clean is a concentrate which will yield 60-128 gallons of cleaning solution per gallon container. Filtered to 0.1 Microns Low Sodium Bio-degradable Free Rinsing. CAS Number not applicable. There are no ingredients present which, within the current knowledge of the supplier and in the concentrations applicable, are classified as hazardous to health or the environment and hence require reporting in this section.